It’s true that the more spicy foods you eat the more of it you’ll crave. It’s the endorphin rush many experience after having chile peppers that keeps them going back for more. The sweat beads building on your forehead, the runny nose, and teary eyes somehow isn’t so bad when that natural rush comes over you. You kind of forget you’ve been stung or just don’t care because the flavor and the feeling is so good! 1. Think Geek – Butch T Scorpion dried pepper 2. Fire Box Spicy Gummy candies 3. Heinz – Jalapeno Ketchup Add some to your burgers or give your french fries a kick of heat! These product finds will definitely get the juices flowing in anticipation of that first kick of heat. Of course some will delivery more heat than others but just watch out for those angry looking dried peppers above, they are nothing to be messed with! That there my spicy foodies is a Trinidad Butch T Scorpion chile pepper, one of the hottest in the world. There are a couple hotter than this (Moruga Scorpion, 7-Pot Douglah) but this may be hot enough for most. The Butch T packs the heat of about 6-7 Habanero peppers so you be the judge, it’s all about what you can handle! Crush it up and add it to pizza, pasta sauce and just about anything you want. I love a good roasted chile pepper, especially one you can just pop in your mouth for a quick and easy snack! These Japanese Shishito peppers aren’t spicy but sometimes you bite into one that really surprises you. You might get a few out of a bunch that are spicy hot but that’s the interesting part, the flavors balance out and deliver a kick when you least expect it! 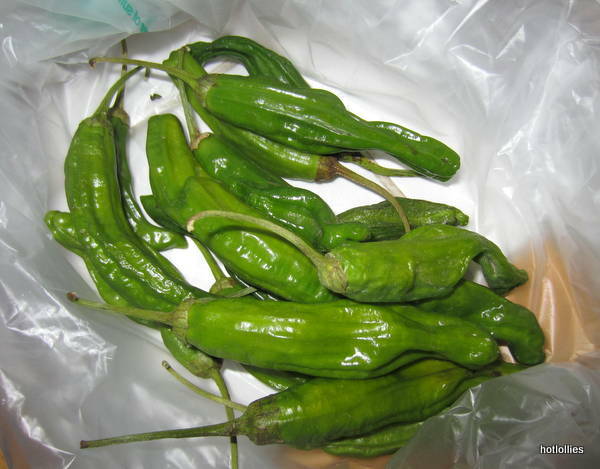 The Shishito pepper is bright green and is easily recognized by it’s wrinkled finger-like shape. Roasted they’re great as an appetizer, just sprinkle a little sea salt! I drizzled a habanero infused olive oil just for more heat but not too much so as to not mask the flavor of the peppers. Pair it with an ice cold Pilsner or Lager for a game day snack. You can also chop these up and toss with a salad, top a pizza, add to your omelet, so many options! Drizzle the peppers with olive oil and toss around. 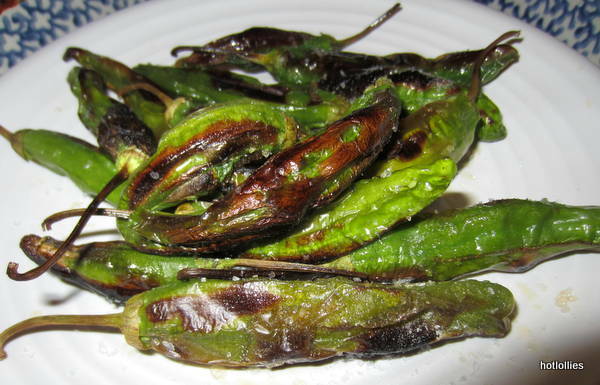 Place peppers on aluminum foil or a cookie sheet and broil for a couple minutes each side. Make sure you keep an eye on them since they roast fairly quickly. Sprinkle a dash or two of sea salt and eat right away.